By cracking the enigma codes, the work of British code breakers at Bletchley Park foiled the German U-boat threat. By William F. Floyd Jr. The small craft from the British destroyer HMS Bulldog launched into the choppy, frigid waters of the North Atlantic. When she came alongside U-110, a boarding party climbed onto the deck of the abandoned submarine. Lieutenant David E. Balme, who led the group, had orders to prepare the German U-boat to be towed if it could be salvaged or simply carry off any important materials found inside if it was about to sink. As the men approached the conning tower, they noticed numerous holes in the structure caused by the Bulldog’s guns. After admiring the damage, Balme and his raiding party slowly began to work their way through U-110. 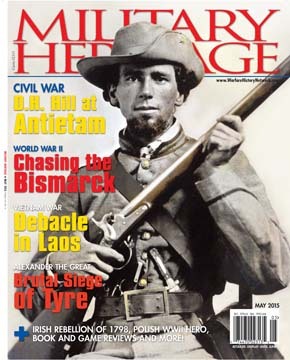 May 2015 edition of Military Heritage. “I found the control room deserted,” wrote Balme. “The U-boat had obviously been abandoned in great haste as books and gears were strewn about the place.” Balme ordered the men to form a line. Captured charts and books were passed along the line to the small boat in which they had arrived. In the radio room, the boarding party found an Enigma cipher machine “plugged in and as though it was in actual use when abandoned,” he wrote. “The general appearance of this machine being that of a typewriter, the telegraphist pushed the keys and finding the results peculiar, sent it up the hatch.” The British attempted to tow U-110 back to nearest base on Iceland, but she sank the next day. The recovered materials were sent to Bletchley Park where the German naval code was successfully broken. The Enigma machine had been developed in Germany after World War I. Arthur Scherbius, a German engineer, hoped to interest commercial companies in secure communications. In 1923 he founded the Cipher Machines Corporation in Berlin to market a machine capable of transcribing coded information. In a matter of three years, the German Kriegsmarine began producing its own version, and it was followed by the Wehrmacht in 1928 and the Luftwaffe in 1933. The Germans eventually developed several types of the Enigma machine, each of which was more complex and harder to code break than its predecessors. An investigation by German intelligence concluded, wrongly as events would show, that the Enigma system was secure and the code could not be broken. Bletchley Park was the old Leon estate, about 50 miles northwest of London. After the death of Fanny Leon in 1937, a number of developers led by Hubert Faulkner became interested in the property. The group successfully bid for the house and grounds. Faulkner intended to demolish the house and other buildings, build a new mansion, and sell the remaining land as a housing site. In August 1938, a secret team calling itself Captain Ridley’s Shooting Party arrived at the estate to assess whether the location was suitable for top-secret work. The group wanted a location far enough from London to avoid Luftwaffe air attacks. The party appeared to be a group of friends enjoying a weekend at a country house. However, the group comprised members of MI6, the Government Code and Cypher School, and a number of scholars turned code breakers. The group was satisfied with what it found. Government agents from the Foreign Office subsequently purchased the estate from Faulkner. At the outset of World War II in September 1939, the code breakers returned to Bletchley Park to begin their work in earnest. GCCS was the organization responsible for deciphering German and other Axis military codes. The organization did not operate on its own. Instead, it received information from a multitude of sources. The location was ideal because it had a large telephone cable running nearby and excellent road and rail links both to London and Oxford. In the early days, before huts sprung up everywhere, the code breakers at “Station X,” as it came to be known, performed most of their work in the main house. But new construction using concrete and steel was undertaken to house the electromechanical devices that cracked the Enigma code settings. The machines, known as “bombes,” were first installed in 1940. Outside of the huts, the workers lived in a sea of mud traversed by boards to walk on. The weather conditions were not good as everything seemed cold, damp, and foggy. The huts were heated by pot stoves and by heat coming off the huge machines. A sickbay was added to the complex to which a number of those operating the bombes had to be sent. The operation of these machines was tedious, and along with the noise, could on occasion cause minor nervous breakdowns. When this happened, those who were stricken would be given a couple of days in sickbay to recover before returning to work. Alan Turing, a mathematician and mechanical engineer from King’s College Cambridge, designed the bombes. Of all the brilliant personalities who worked at Bletchley, Turing was one of the most exceptional. He had written a paper on computable numbers before the war. He was in his late 20s with a disheveled and eccentric air. He used an old tie to hold up his pants, rarely shaved, and had a noticeable stutter. He was acutely shy and developed the habit of working continuously for days at a time before collapsing in exhaustion. The commanding military officers could never figure him out. Turing ran Bletchley’s famous Hut 8 where the bombes were first developed. These machines were six by eight feet, consisting of 30 rotating drums that ran through thousands of letter possibilities in order to find the correct match of plain letters with encrypted letters. The bombes led to the Colossus, the world’s first operational computer. Initially, it could take days to decode a signal but with Colossus the time was eventually reduced to minutes. The bombes did require a lot of maintenance, as an average of one in eight would fail on a shift. Personnel from the Royal Air Force maintained the machines which had to be opened up to work through its labyrinth of cables and gears to make repairs. The primary function at Bletchley Park was breaking and reading the German Enigma code, particularly that of the Kriegsmarine. The naval code was of prime importance because German U-boats sinking were supply ships in the North Atlantic. Those losses inflicted on merchant shipping in the Atlantic became most serious in the period from July 1940 to July 1941. The German naval code tended to leave nothing to chance. It did not permit its code clerks to choose the code wheel settings as the Luftwaffe allowed. The Luftwaffe enciphers, instead of choosing three letters at random, such as HWX, would often use a girlfriend’s names, such as ANN, or letters near those of the preceding message so the setting up would be less work. This reduced the number of settings the British code breakers had to solve. As a result, the British began reading Luftwaffe intercepts in the spring of 1940, helping to win the Battle of Britain. The German naval system was so well thought out that, at the time, no British code breakers could crack it. Then a brilliant Cambridge undergraduate, Henry Hinsley, had the idea of stealing Enigma keying books from a German ship or U-boat. One successful mission occurred with the boarding of U-110. The solutions obtained from the Enigma machines were translated, supplemented with information from previous solutions, and sent to the appropriate branch of the armed forces. The capture of the keying books aided greatly in allowing the Enigma codes to be read. Many historians believe it substantially shortened the war. The thrill of reading deciphered messages direct from the enemy appealed to Prime Minister Winston Churchill. Instead of reading summaries of the messages, he wanted to receive the information raw, exactly as it had been decoded and translated. He did not like the idea of it being watered down, presenting a rosier picture than what was really happening. Each day, no matter where he was, a special box containing the decoded messages was delivered to Churchill by a messenger from the Secret Intelligence Service. Churchill was the only one with the key to unlock the box. Even Churchill’s closest aides knew nothing about the decrypts. Over the next few years, the mass of information decoded from the Wehrmacht, Luftwaffe, Kriegsmarine, Abwehr (German military intelligence), and even from the German police and railways revealed much about the enemy’s military intentions. For those who had worked at Bletchley Park, there was always the feeling that every single contribution, no matter how small, counted. For the young people working in such an atmosphere, the excitement was unmatched in anything they had done before the war or would do after. How would they depressurize after years of working at maximum effort on tasks that could literally mean life and death for so many? As with those in the armed forces, demobilization at Bletchley was a gradual process. The staff was ordered to dismantle the bombes wire by wire and screw by screw. However, after Victory in Europe Day, there was still work to be done. The focus shifted to the Japanese codes until their surrender. The winding down and thinning out of hut personnel meant that normal days off, for those remaining, might be few and far between. But for those marching out of the gates for the last time back to a life of normal hours and work not governed by a 24-hour cycle could be difficult to negotiate. After this experience, normal life was a little too normal. After the war, the Bletchley site was still to serve a number of useful purposes. A teacher training college for women opened at the site in 1948 and remained in use until 1976. The Government Communications Headquarters and British Telecon occupied the site until 1993. It was around that time that Bletchley was facing the prospect of being turned into a supermarket and housing development. Bletchley might have been torn down were it not for the intervention of the Bletchley Historical and Archaeological Association. Prince Edward, Duke of Kent, became the trust’s chief patron. In 1994 the site was tentatively opened as public space. The National Museum of Computing opened in Block H in 2007. The following year, the site was recognized by such organizations as English Heritage, which protects historically and culturally significant buildings and monuments. The preservation effort was due to the work of many veterans and volunteers. As a result of their work, the original look and feel of the site has been preserved. It is only fitting that such an institution be preserved for future generations to visit and appreciate. Tags Bletchley Park, Enigma code, luftwaffe, U-Boat, wehrmacht, Winston Churchill.